These may not be my prettiest cookies, but it was an attempt at vegan royal icing and it actually wasn’t TOO bad. Williams sonoma had these cookie cutters more half off a few weeks ago, (they still are!) so we bought some and I wanted to see how hard decorating cookies really is. I’m definitely no pro and have some work to do, but they definitely made my 4 year old happy. I used pastry bags to pipe; would like to try the squeeze bottle route if I can get my hands on some. I used the sugar recipe from vegan cookies invade your cookie jar. Place sugar in bowl, add non-dairy milk and whisk until smooth. Add in vanilla and corn syrup. Whisk some more. Icing will be smooth, shiny, and a little runny. 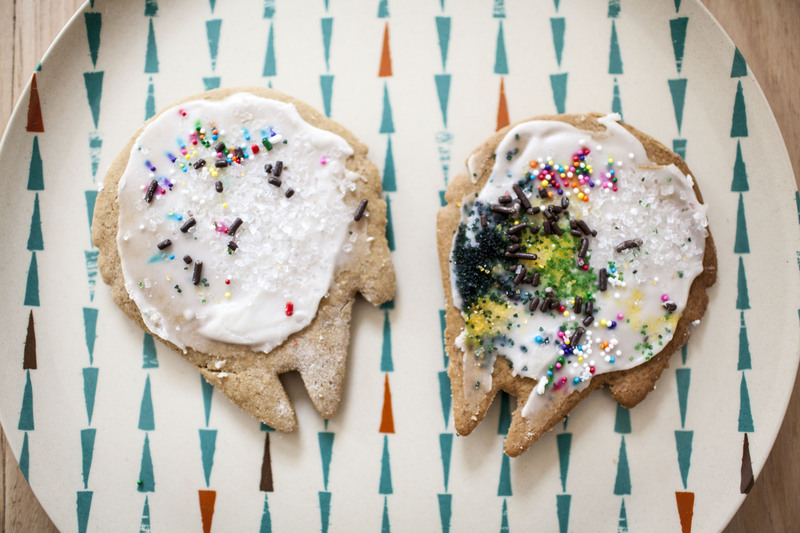 You don’t want it really runny or the icing won’t stick to the cookies. Icing will be hard with a shiny finish once dry. You can either dip cookies into icing, or use this icing in a pastry bag. Ok, so maybe the holidays are OFFICIALLY over, but there’s always a good place for chocolate and peppermint in my life. 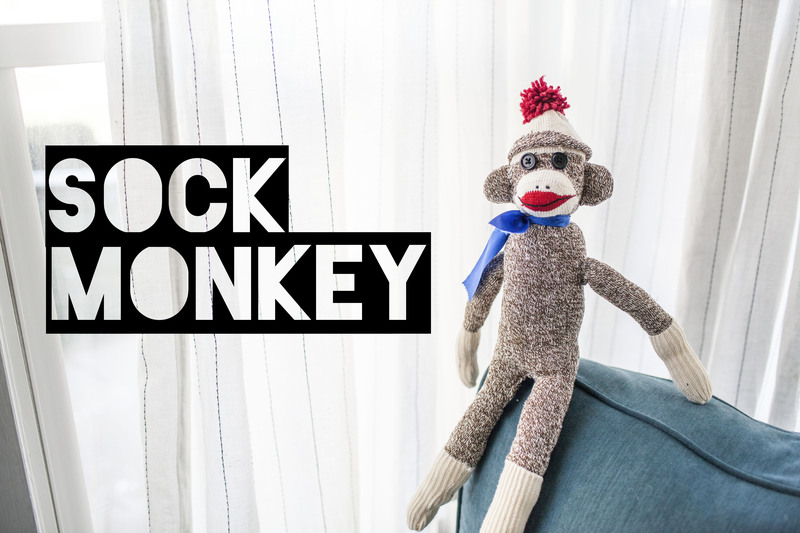 Plus, it gives you something to do with all those random candy canes you have lying around! 1. Preheat the oven to 350 F. Lightly oil a cookie sheet, or line it with parchment paper. 2. Melt the Earth Balance, then set aside to cool a bit while you gather your other ingredients. 3. Combine the flax meal and the non-dairy milk in a mixing bowl, and stir them well. Add the Earth Balance, and sugar. Mix well. 5. Add the flour, baking powder, and salt. Combine, mixing with a wooden spoon. It will form a thick dough. 6. Turn out the dough onto your cookie sheet, and shape it into a long, flat log. It should be able 12 inches long and 1 inch high. Bake for 20-25 minutes, until the loaf has puffed a little and the edges are turning golden. Remove from oven, let cool for at least 20 minutes. 8. Return the baking sheet to the oven, and bake for 10-15 minutes, until the biscotti is firm to the touch (but not hard), and is becoming a little more golden on the edges. Allow to cool. 9. Melt 1/2 cup of chocolate in a double boiler or in a microwave. Dip each piece of biscotti in the chocolate, then set on parchment paper. Sprinkle crushed candy canes over the chocolate before it cools. Let set for about 30 minutes (or 15 minutes in the fridge). 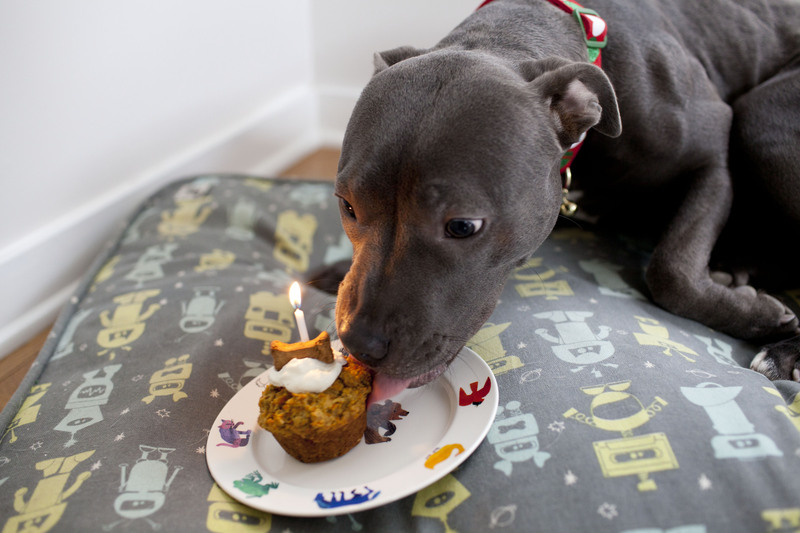 A very special girl turns one today, so pupcakes were in order! 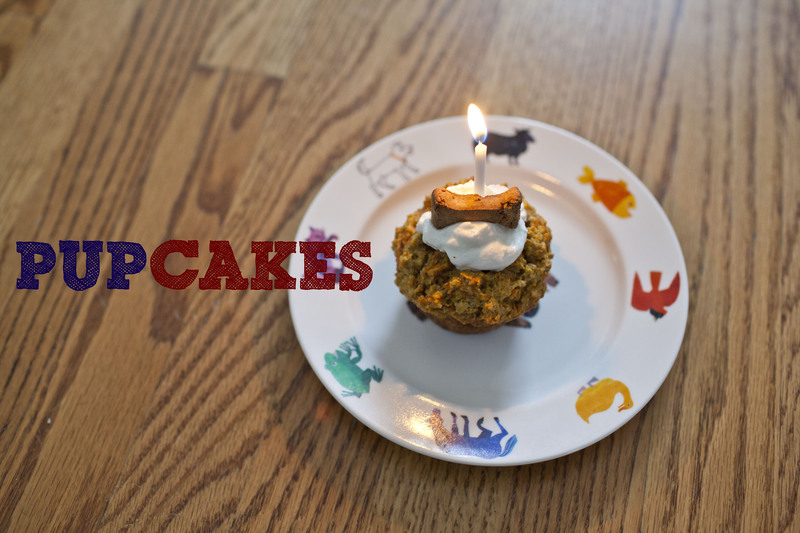 I woke up early and made these for the pups to have around lunch time, after singing to the birthday girl first, of course. Happy birthday to my little stella bean! Mix together the flours and the baking soda; add the rest of the ingredients and mix until combined. Grease and fill four muffin pans with the batter and bake for 20 minutes, or until a toothpick inserted in comes out clean. Top with dallop of greek yogurt. This has been on my to-do list forever! And a few months ago, the thrift store had the socks I needed for 99 cents. I made this guy for milo for christmas, and I’m so so excited to give it to him! I love how it turned out, and I can’t believe how easy these are to make!! I looked at tutorials online, but in the end ended up following this you tube video. Everything is very well explained and I even learned how to properly do a whip stitch and a slip stitch! 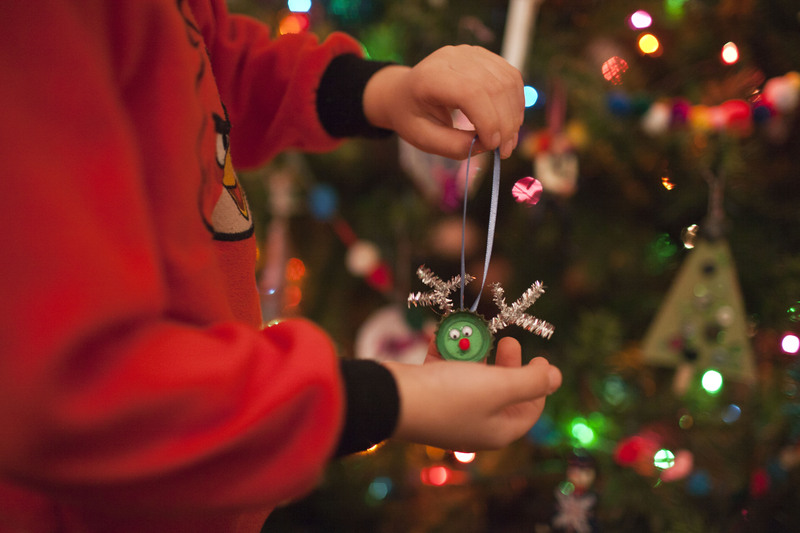 Are you making anything handmade this christmas? They are my favorite kinds of gifts to give! We have been collecting bottle caps for some time for various projects. We finally put some to use. 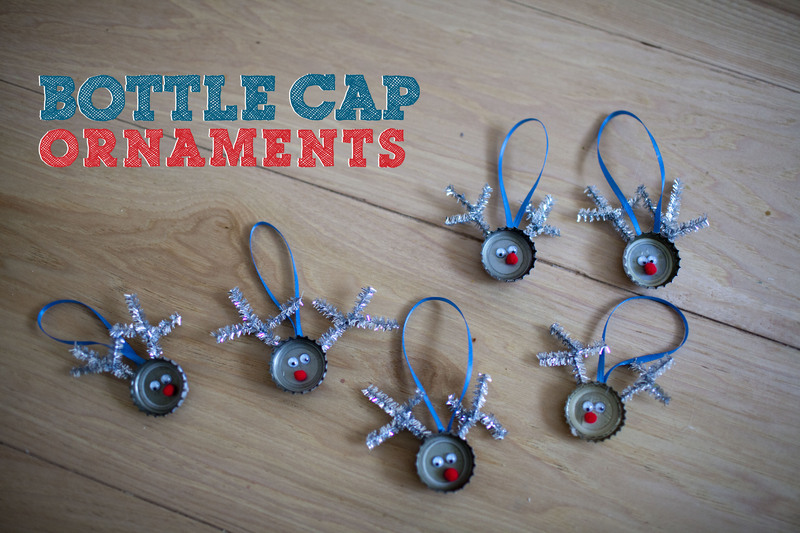 Creating these little reindeer bottle cap ornaments (or I bet you can stick a magnet on back if you wanted to do that instead) was pretty easy! First we created the antlers from the pipe cleaners. 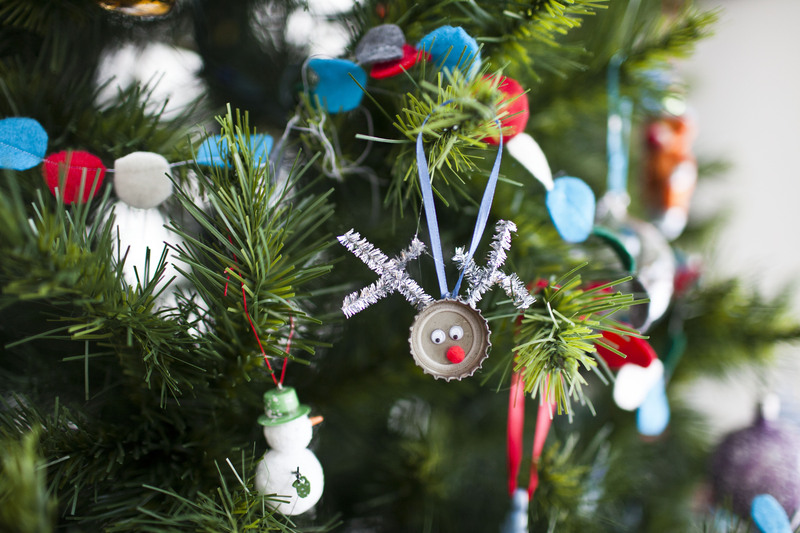 Cut your pipe cleaners to size and create little antlers. I then used hot glue to affix the ribbon to the back upper center of the bottle cap. 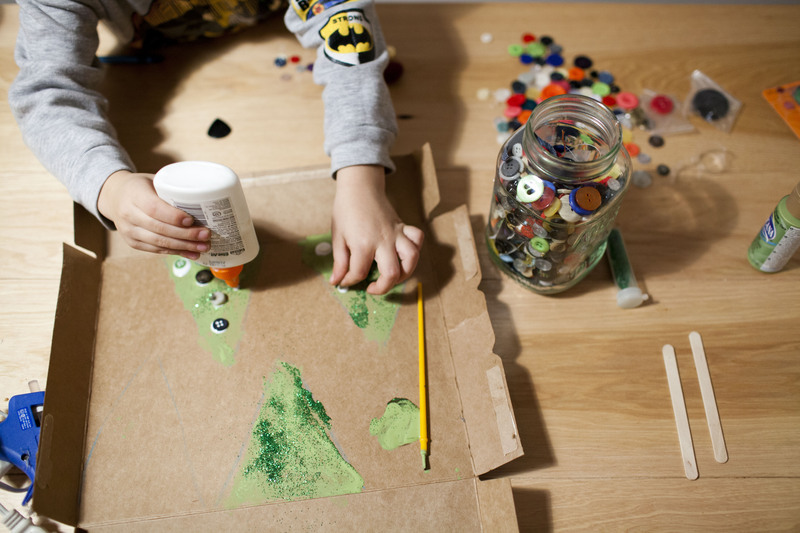 Also use the hot glue and affix the antlers to the back. Turn your bottle cap over to glue on the face. I used super glue here, since I had little hands helping me, I didn’t want them to get burned by the hot glue. I suppose elmer’s glue would work as well, but I went with super glue, hoping it would hold up in the long run. 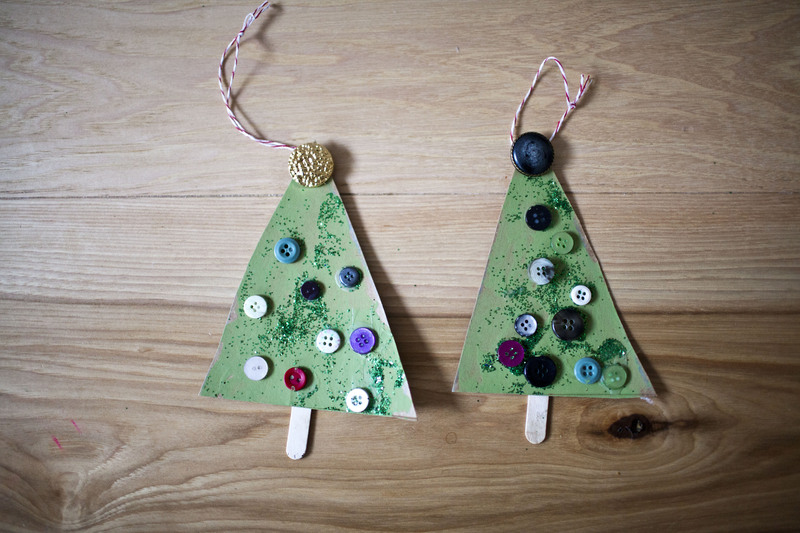 Hang on a tree or attach to the top of a present! Whisk together the oil and sugar for about three minutes. Add molasses and non dairy milk. Sift in all the other dry ingredients and mix until a stiff dough is formed (I needed to add a little bit more milk and mix with my hands). Flatten the dough into a disk and wrap in plastic wrap and chill for an hour. Preheat oven to 350 degrees. Prepare your cookie sheets with parchment paper. 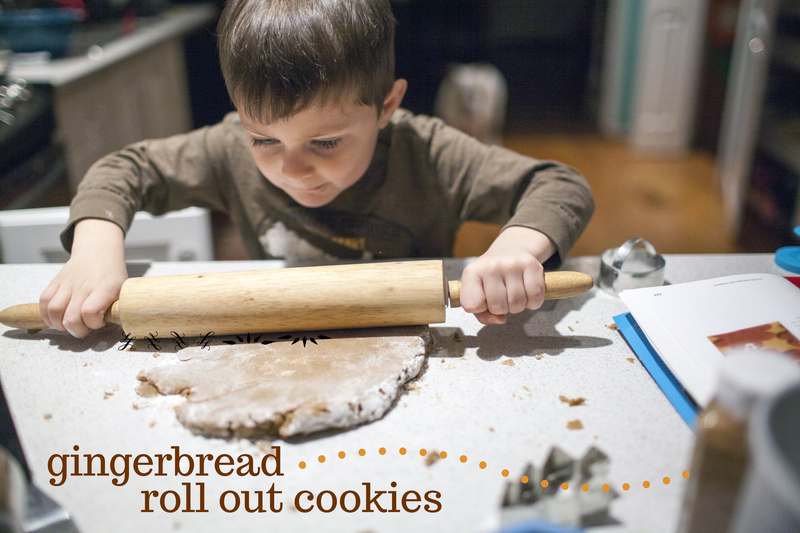 On lightly floured surface, roll the dough out and make shapes with your cookie cutter. Move to prepared pan and bake for 8 minutes. 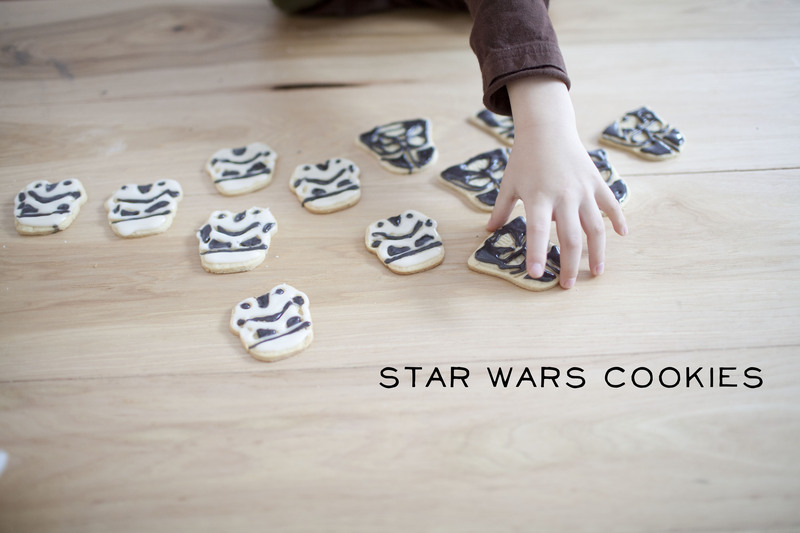 Remove cookies and let them cool for two minutes on the baking sheet. 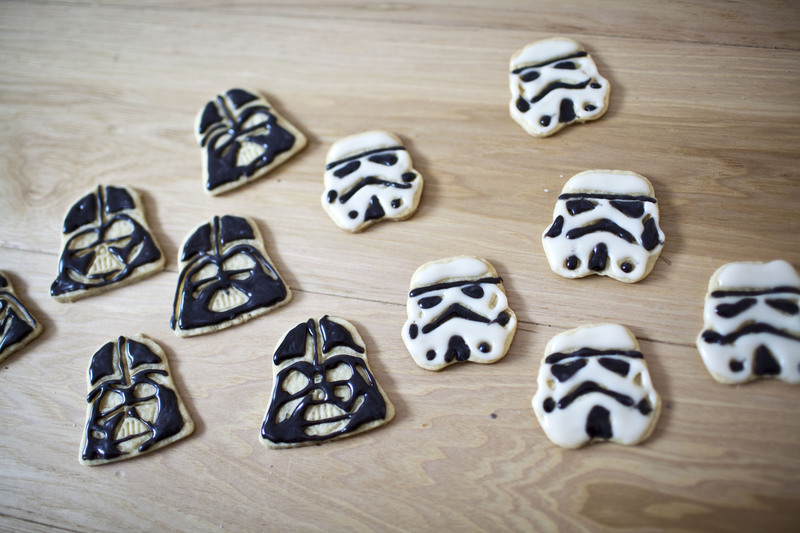 Wait until they are completely cool before icing. Whisk all the ingredients using a fork or wire whisk until smooth. Add the milk one tablespoon at a time….Combine to form a glaze that can easily be spread with knife or piped from a pastry bag. My christmas tree is looking a little bare. 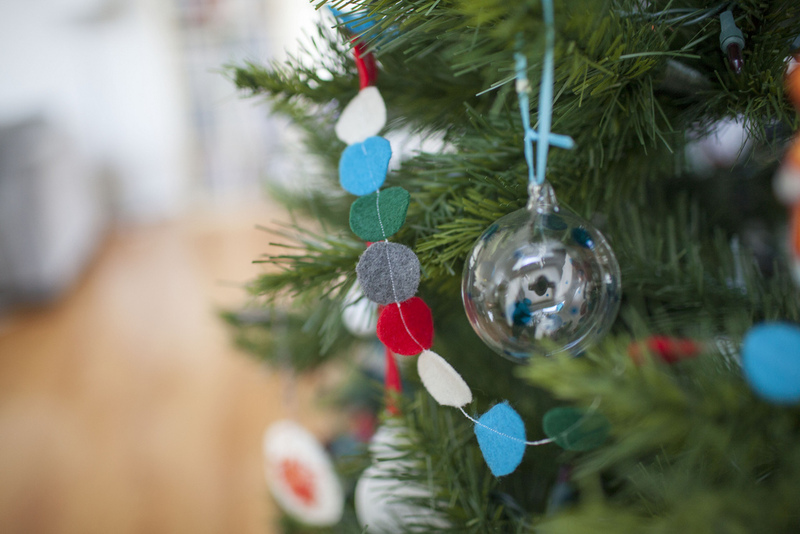 Last year I made pom pom garland, but for some reason it doesn’t seem like enough. I have been contemplating buying the felted wool balls and making my own, buuuut they are expensive! 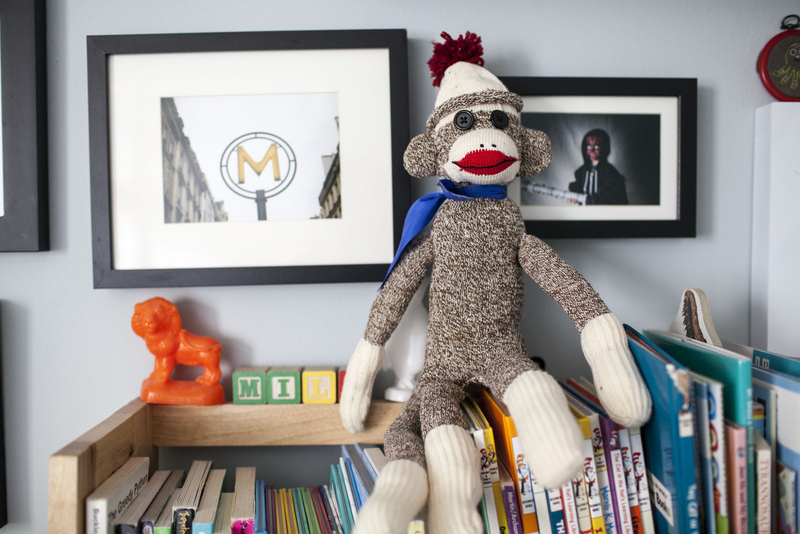 I decided since I have a ton of felt left over from making superhero masks earlier this year, I would put that to use and see what I can come up with. I spent a morning cutting a WHOLE bunch of circles from the felt. Then I ran them through my sewing machine and made a few long strands at different lengths. It seems to be doing the trick for now! 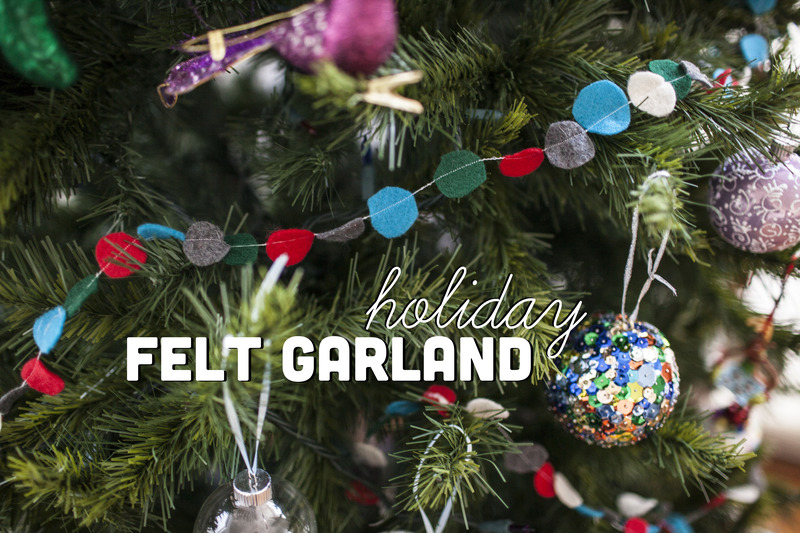 I do have a bunch of 100 percent wool yarn that i bought about 10 years ago, well before I was vegan, so maybe I will figure out how to make those little balls myself one of these days….but I think this garland gives my tree just the little bit of love it needed! 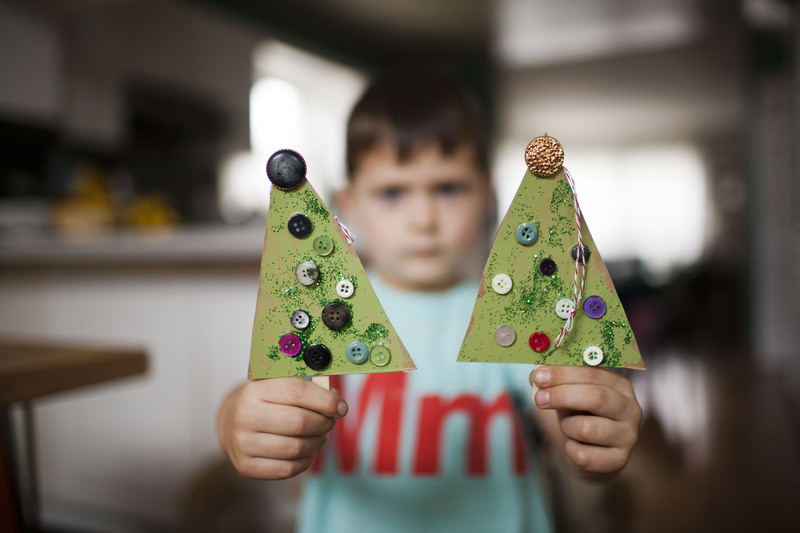 Milo and I made these christmas tree ornaments out of an old cereal box. Its really easy, and Milo enjoyed this little craft. It was a good project for him because he was able to do just about all of the steps himself. He was super proud of his little trees at the end! Punch a hole in the top and insert string. Hang and enjoy! My first christmas craft post! Its that time of year already. I made some of these little trees using jewelry wire, small beads and buttons (of various sizes). You basically cut a long piece of the wire, and fold in half. Start building the tree from the bottom. String about 4-10 beads (depending on the size of your beads) and twist. String a button through the wire. I found it was easiest to string one bead through BOTH pieces of the wire at once (vs. two beads seperately) and twist, then place another button. Repeat until you get to the top, finishing with the smallest button on top. Fold one of the pieces of wire down through the top of the button hole, then use the other wire to wrap around the loop you just made to secure in place. These would make cute little ornaments or gift toppers.